TOLEDO, Ohio - Malik Rosier threw for two touchdowns and ran for three more, and No. 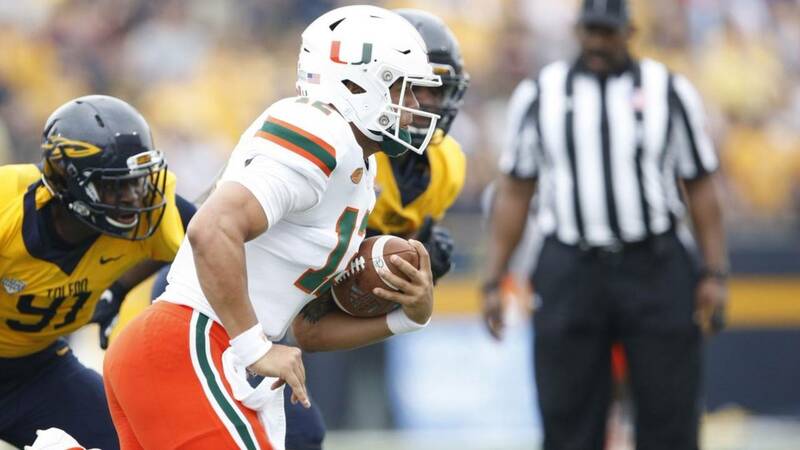 21 Miami outlasted upset-minded Toledo 49-24 on Saturday. The Hurricanes (2-1) never trailed and led 21-0 late in the first half, but Toledo (1-1) twice pulled back to within a touchdown. Even then, however, the defending Mid-American Conference champion couldn't stop Rosier and Miami. Rosier threw for 205 yards and ran for 80, and Jeff Thomas had five catches for 105 yards and a TD. The Hurricanes lost standout safety Jaquan Johnson late in the second quarter to an apparent injury. He was back on the sideline using a stationary bike during the second half, but Miami's defense was not the same without him. Rosier scored on runs of 5 and 2 yards in the first half and also threw a 38-yard touchdown pass to Thomas. It was 21-7 at halftime, and the Hurricanes had plenty of answers when Toledo made a game of it in the third quarter. DeeJay Dallas ran for a 19-yard TD to put Miami up 28-14, and Rosier's 5-yard scoring pass to Lawrence Cager made it 35-21. The Rockets settled for a field goal on their next drive, and Rosier broke free for a 37-yard touchdown run to make it 42-24 with 12:18 remaining in the game. Dallas finished with 110 yards on 17 carries. Miami: The Hurricanes are fighting an uphill battle to get back in the national title picture after a season-opening loss to LSU. They have an obvious concern if Johnson's injury turns out to be a nagging one, but Rosier and Thomas were more than Toledo's defense could handle. Toledo: The Rockets aren't seeking moral victories. They've beaten teams such as Arkansas and Iowa State in the past few years, and they obviously hoped for a better showing against Miami. This was still anyone's game in the third quarter, but not so much in the fourth. Teams like Miami don't play road games like this very often. There's a lot to lose and not much to gain, but it will be interesting to see if voters reward the Hurricanes for a convincing road win over a strong MAC program.